For other uses, see Silent Night (disambiguation). 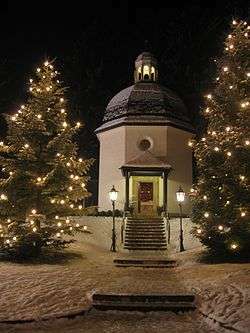 The song was first performed on Christmas Eve 1818 at St Nicholas parish church in Oberndorf, a village in the Austrian Empire on the Salzach river in present-day Austria. A young priest, Father Joseph Mohr, had come to Oberndorf the year before. 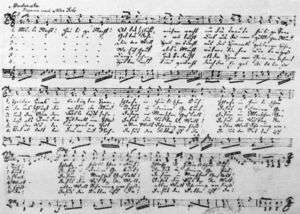 He had already written the lyrics of the song "Stille Nacht" in 1816 at Mariapfarr, the hometown of his father in the Salzburg Lungau region, where Joseph had worked as a co-adjutor. The original manuscript has been lost. However, a manuscript was discovered in 1995 in Mohr's handwriting and dated by researchers at c. 1820. 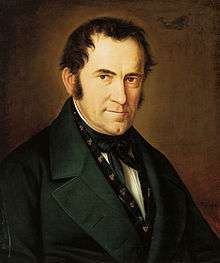 It shows that Mohr wrote the words in 1816 when he was assigned to a pilgrim church in Mariapfarr, Austria, and shows that the music was composed by Gruber in 1818. This is the earliest manuscript that exists and the only one in Mohr's handwriting. The song was sung simultaneously in English and German by troops during the Christmas truce of 1914 during World War I, as it was one carol that soldiers on both sides of the front line knew. Several theatrical and television films depict how the song was written. Silent Night, Holy Night (1976) animated short film by Hanna-Barbera. Silent Mouse (1988) television special directed and produced by Robin Crichton and narrated by Lynn Redgrave. ↑ "Österreichische UNESCO-Kommission – Nationalagentur für das Immaterielle Kulturerbe – Austrian Inventory". Retrieved 25 December 2014. ↑ "BBC Religion & Ethics". BBC. 2009-08-04. Retrieved 2011-12-06. ↑ Underwood, Byron Edward, "Bishop John Freeman Young, Translator of 'Stille Nacht'", The Hymn, v. 8, no. 4, October 1957, pp. 123–132. ↑ Meredith Ellis Little (2001). Siciliana. Grove Music Online. ISBN 978-1561592630. ↑ Gerlinde Haid (1994). Siciliano als Typus weihnachtlicher Volksmusik. 175 Jahre "Stille Nacht! Heilige Nacht!" (in German), p.135–146. Salzburg. ↑ Ronald M. Clancy, William E Studwell. Best-Loved Christmas Carols. Christmas Classics Ltd, 2000. ↑ "Silent Night". Silent Night Web. ↑ Stanley Weintraub Silent Night: The Remarkable Christmas Truce of 1914. New York: Free Press, 2001. ↑ "Silent Mouse (1988)". Turner Classic Movies. Retrieved November 29, 2015. ↑ "Buster and Chauncey's Silent Night". TCM. Retrieved 23 November 2016.